In early 1982, El Salvador was a dangerous place for journalists covering the civil war between FMLN guerrillas and the country's armed forces. Despite the danger, four Dutch journalists,Koos Koster, Jan Kuiper, Joop Willemse and Hans ter Laag, ventured out to the department of Chalatenango to get an interview with guerrilla fighters. The Salvadoran army ambushed their group and killed all the journalists. 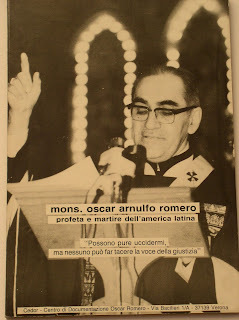 March 24 is the 39th anniversary of the assassination of Oscar Romero by a death squad in El Salvador. It was one of the opening events of a bloody civil war which would have tens of thousands of civilian victims. Despite the notoriety of the murder of a man who would subsequently be declared a martyred saint of the Roman Catholic church, no prosecution of his killers has ever reached conclusion in the Salvadoran courts. On this International Water Day, a march proceeded in the streets of San Salvador demanding that the country protect its water resource and that water not be privatized or put under the direction of business interests. The march headed towards the headquarters of the sugar cane trade association because the industrial sugar producers are one of the largest water exploiters in the country. It was the second water march in three days. On Wednesday, the University of El Salvador ("UES") led marchers towards the National Assembly. The UES was protesting a legislative proposal approved in committee which would give private interests representation on a governing water board. The UES march resulted in some protesters allegedly damaging property including automobiles and windows. Two protesters were taken into custody. According to the industry trade association CAMTEX, the entire textile sector exported $2.5 billion in 2018 and represented 46% of El Salvador's total exports. The industry produced 84,448 direct jobs, with an average wage of $524 per month. The minimum wage in the sector is $295.20 per month or $1.23 per hour. 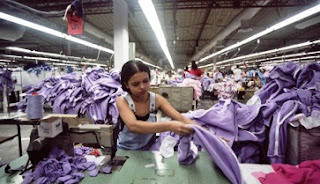 The leading exports from El Salvador's textile maquila factories are cotton t-shirts and nylon socks. Hanes and Fruit of the Loom are the leading brands, together representing approximately 20,000 jobs in El Salvador. There are frequent reports of abusive working conditions in the maquila factories, especially with regards to the treatment of women. El Salvador's Supreme Judicial Court has decided to limit any investigations by its Probidad (Integrity) unit to public officials who had left office less than 10 years ago. The Probidad unit is in charge of investigating officials in the government who are unable to explain the sources of increases in their net worth during their time in office. Following the ruling of the Supreme Judicial Court, officials who stole their corrupt dollars prior to 2009 can breathe easier. The ruling means that only the FMLN governments of Mauricio Funes and Salvador Sanchez Ceren will fall within the purview of the corruption unit after June 1 and not officials from the prior ARENA governments of Tony Saca, Francisco Flores and their predecessors. One prominent figure who may escape censure is Ana Vilma de Escobar, vice president of El Salvador during the Saca administration. Probidad had been reviewing an unexplained increase of $11 million in her wealth during her time in office. There were two presentations on Wednesday in Washington, D.C. which are well worth watching. The first was Nayib Bukele's first public speech since being elected president of El Salvador on February 3. Bukele chose to address the conservative Heritage Foundation in English to announce that El Salvador was open for business. The second presentation, at almost the same time that Nayib Bukele was speaking, was titled New Government, Ongoing Agenda: Human Rights, Corruption and Accountability in El Salvador, and featured experts on the human rights situation in El Salvador speaking before the Tom Llantos Human Rights Commission. 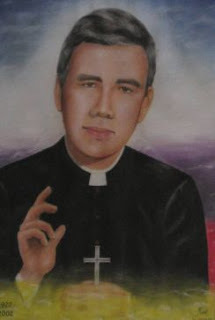 Sunday, March 12, is the 40th anniversary of the martyrdom of Father Rutilio Grande, S.J. Grande was a Jesuit priest working with poor campesinos in the countryside near El Paisnal, El Salvador. On March 12, 1977, while driving on the road between El Paisnal and Aguilares, assassins from Salvadoran security forces killed Father Grande, as well as two of his campesino parishioners, Manuel Solorzano, 72, and Nelson Rutilio Lemus, 16. Rutilio Grande was a friend of Archbishop Oscar Romero. Father Grande would be the first of many priests to be murdered in El Salvador's bloody years of internal conflict. It would be wrong to call almost 500 murders in 60 days good news, but for El Salvador, it is better news than the country has had in a long time. According to statistics from the country's National Civilian Police (PNC) reported in El Faro, the homicide rate in the country has fallen steadily in the past three years to a much improved, but still bloody, level. In January and February there were 491 homicides in El Salvador. Compare that to January and February of 2016, when there were 1404. This was the lowest total for the first two months of a year since 2004, except for the years 2013 and 2014 during the so-called tregua, or gang truce. El Salvador has averaged about 8 homicides a day this year compared to an average of 18 daily during the bloodiest year, 2015. These improved numbers continue a downward trend which started in 2017 and has continued. The government takes credit with the policies put in place by its security ministries. After being on a vacation for a few weeks, here are some short news pieces to catch you up on what is happening in El Salvador. International Women's Day was commemorated yesterday. Many organizations issued statements or held activities. A march to commemorate the day proceeded through San Salvador. Leading up to International Women's Day there had been some good news as three more women, imprisoned after suffering miscarriages and then prosecuted for abortion/murder had their sentences commuted by El Salvador's Supreme Judicial Court. Many groups pointed out how far El Salvador falls short on women's rights with high rates of femicide, abuse, discrimination and failure to value women's work.